Is a Whole Foods, New Seasons, or Trader Joe’s store going in down the street from you? Look forward to an increase in the value of your home. Between 1997 and 2014, homes near a Trader Joe’s or Whole Foods appreciated an average of 148 percent and 140 percent, respectively. The typical U.S. home appreciated by 71 percent over the same period. Homes located near a Trader Joe’s or Whole Foods had a median value of $406,600 and $376,200, respectively, at the end of 2014, while the median U.S. home was worth less than $180,000. Neither Whole Foods nor Trader Joe’s appears to be drafting off already hot neighborhoods. 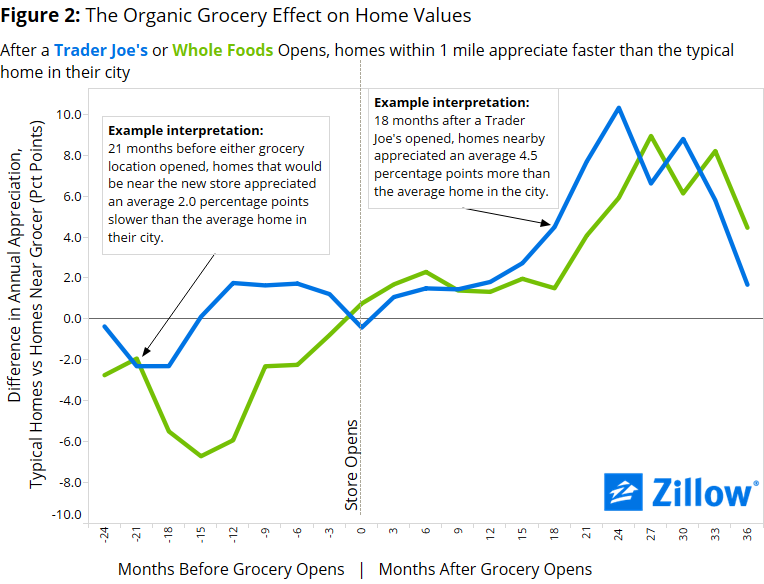 When factoring in store opening dates, homes near both chains began appreciating faster after the store opened than the typical home in their city overall. The same analysis found the median home price citywide had quadrupled in that time period, as American and international investors bought up commercial property, more local businesses opened up and other businesses relocated or expanded operations within Detroit’s city limits. Clearly, more is going on in the city than the opening of a Whole Foods to bring about the change in property values, but a Whole Foods opening could be considered a noted shift in more widely recognized brands operating in the city. Whether the construction is underway for a new grocery store in your neighborhood – or if you want to trade in your current home for one closer to your market of choice – the experienced professionals of the SellPDX team are here to help.